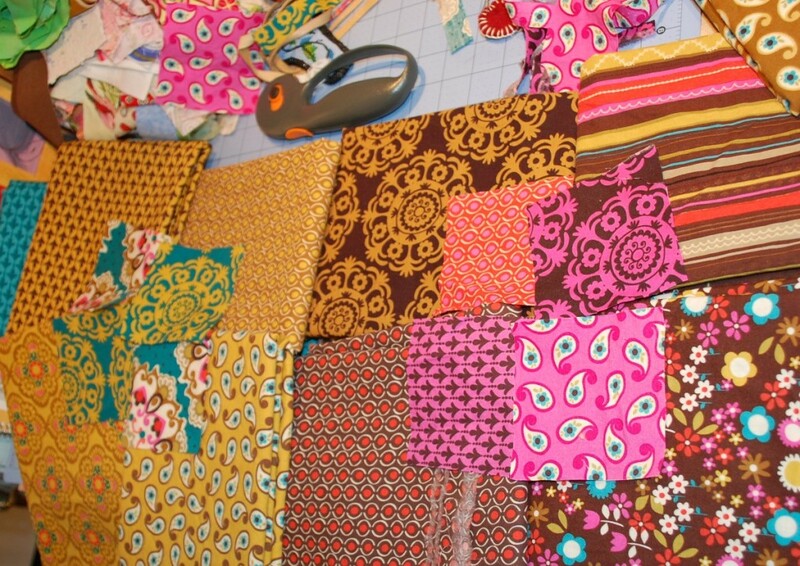 Thought I would start off with a pile of fabric to entice you into reading this post….did it work? I can’t believe I have written in here since the 14th! What a bad blogger I am ….actually just a very busy one. In late January, the Michael Miller Fabric company asked me to make a quilt for their new line the Big E collection (I would have links here, but it looks like the MMF site is down at the moment…so I will try to come back and add the links when I get the chance) They wanted it pretty fast, and as usual, I thought I could get it done fast, but couldn’t. (thanks for being so gracious, Christine at MMF….) but it is done now, and the pattern should be available on their site soon. I will let you know when it is actually up. 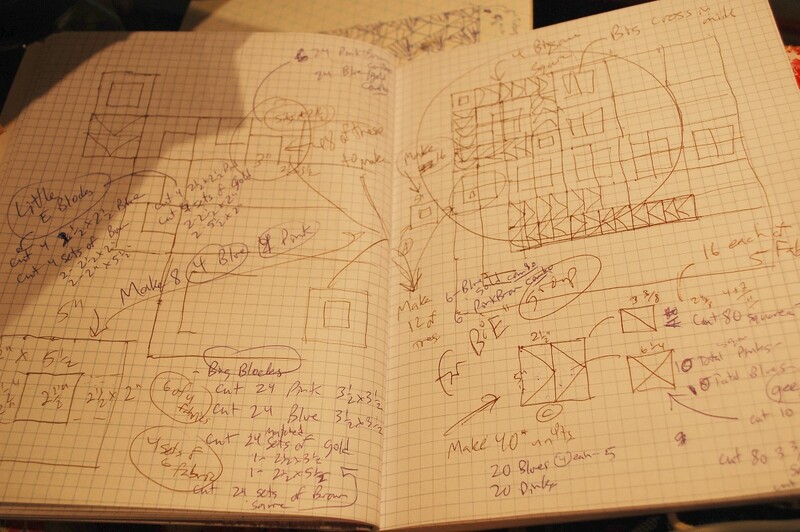 Here are just a few pix of the process I usually go through….sketches in my quad composition book…I LOVE these books for sketching quilt designs in. I don’t know why, I just do…they aren’t often “big” enough, but I like the hard covers and the gridded pages. And here is some playing, experimenting, etc. 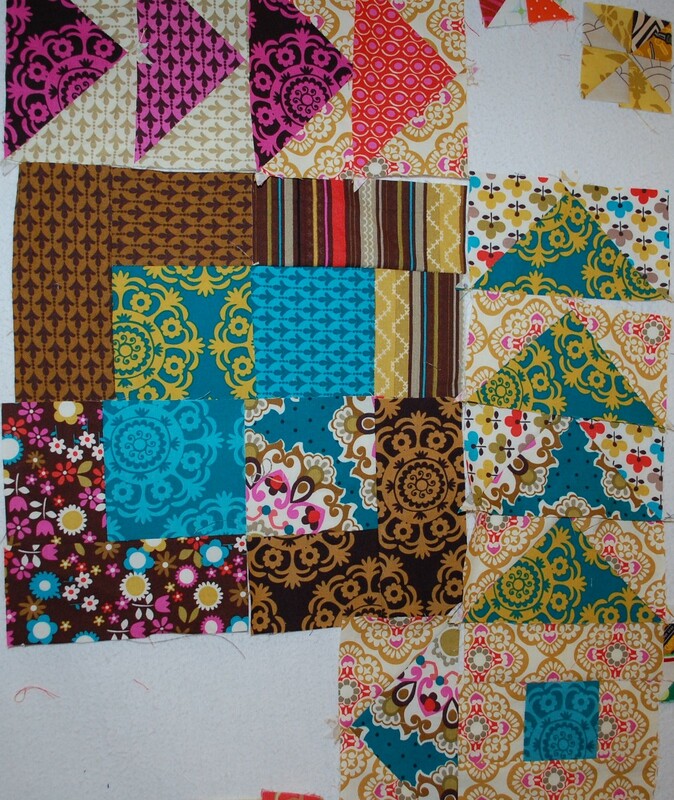 And here is the quilt top before quilting. 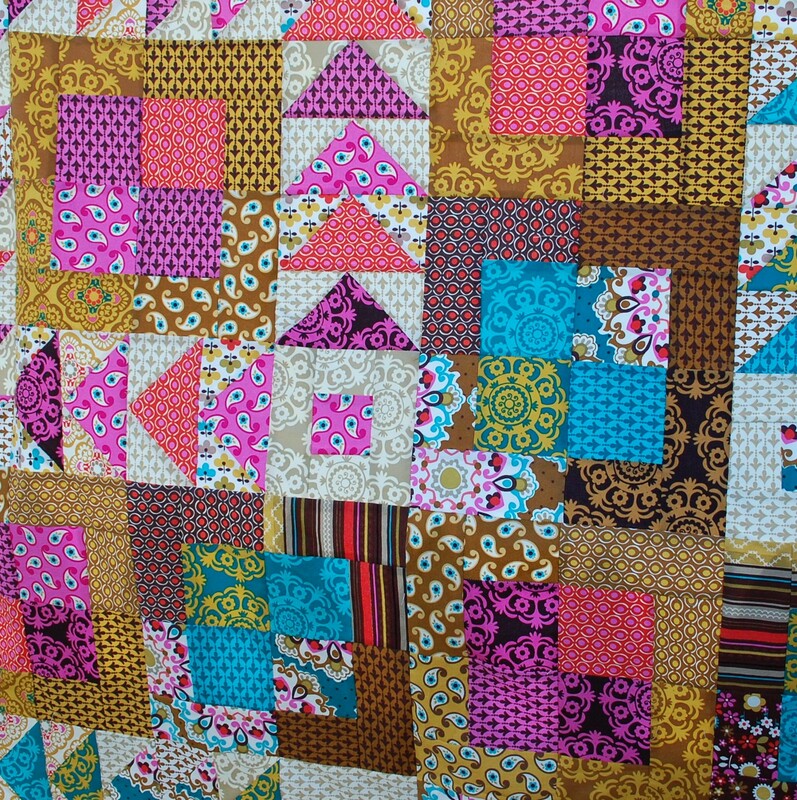 I am pretty sure that I didn’t get pictures of it quilted. And after I finished the binding, I needed to send it off straight to New York City to the MMF offices. So this is all you get until the pattern comes out online. I will link to it from here too on the Downloads page. 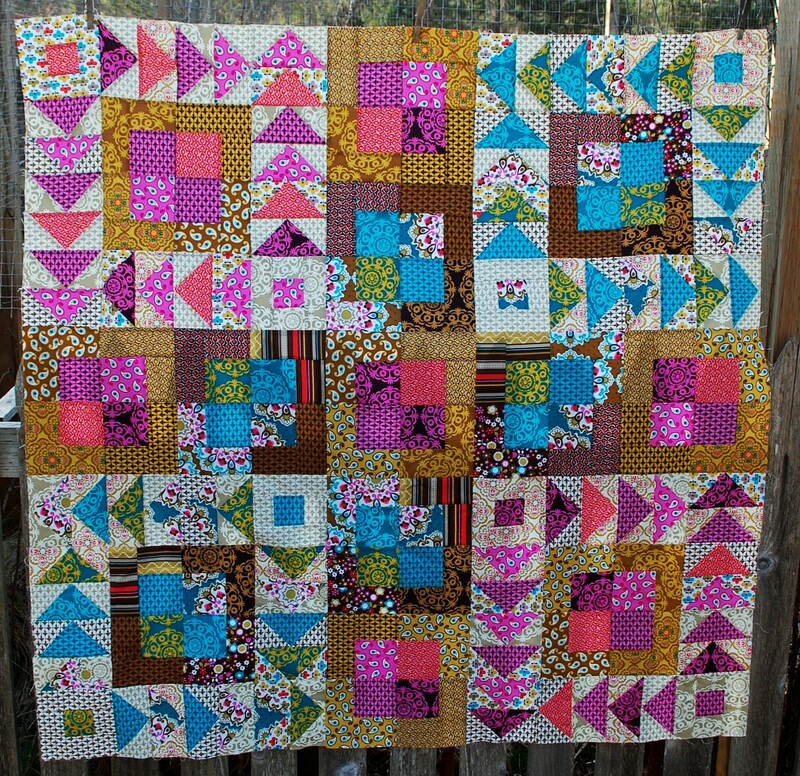 When I first started it, I thought….oh, this is going to be too busy again, but I think it came out with a nice mix of an old-fashioned, yet tragically hip look to it….oh, and yeah, I named it the Big E-asy Quilt cause it is pretty easy, and the collection is called the Big E collection. …..yeah, kinda Ch-EE-sy I know, but that’s kinda how I roll sometimes. Ask Linda, she’ll roll her eyes in silent-shaking-her-head-agreement…. 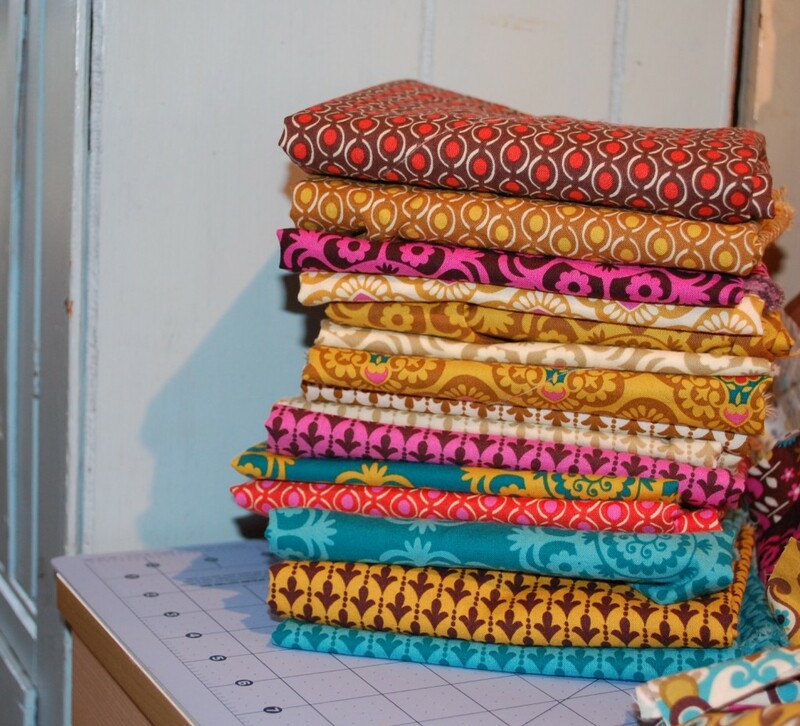 Anyway, I even felt compelled to make this runner from the scraps….it still needs binding….but having it quilted makes it that very much closer to being finished. 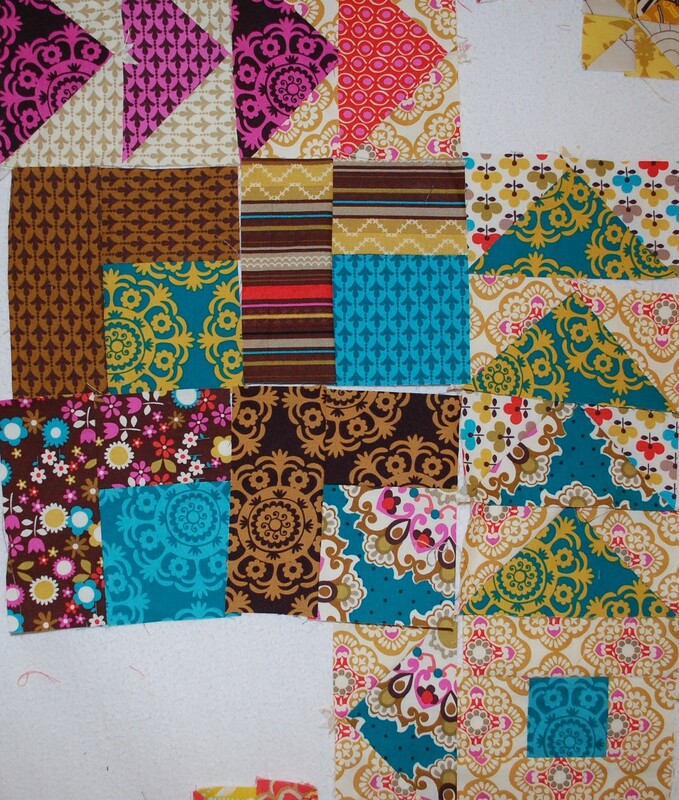 I am now trying to wrap up a big quilt from a Paula Prass collection for a magazine, and as usual, I bit off more than I could chew with it. 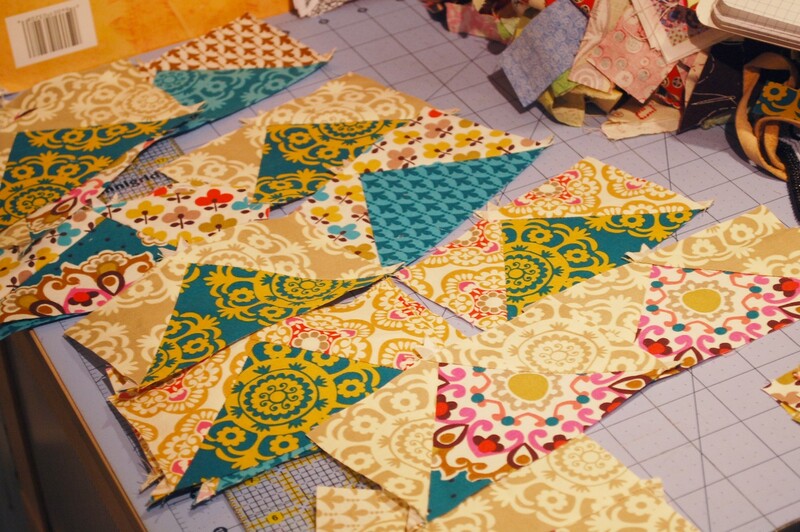 It is a big quilt all in 60 degree triangles, and it is very time-consuming. I love and hate it at the same time right now. I know when it is done, I will like it. 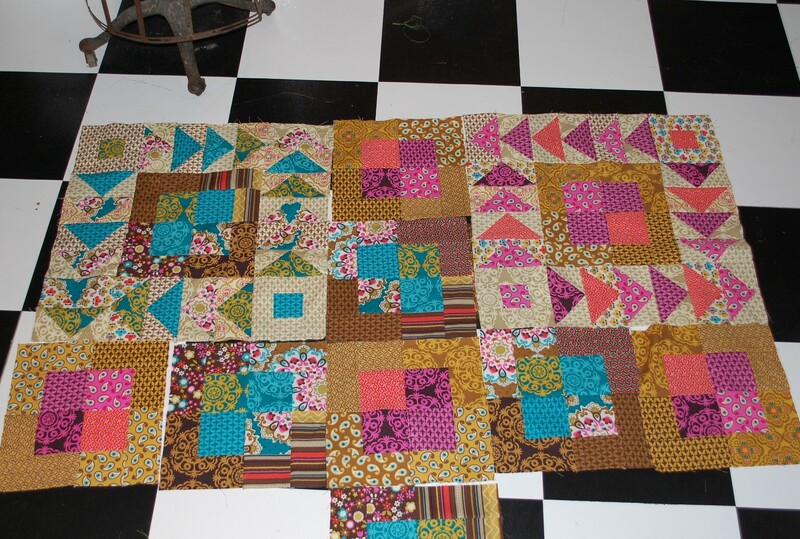 It is coming along well, but I am already bored with the piecing and there are over 1000 triangles in this baby. I just want it done. I think I get that way more when the fabric is all from one collection, but I dunno. 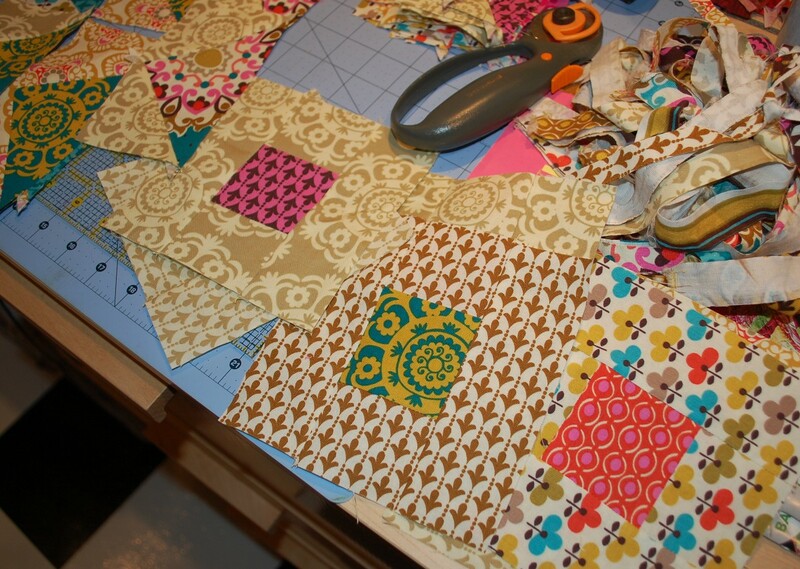 I will show you some sneak peeks at the scraps from that project later. Since it is magazine bound, I can’t reveal any more about it here……but it will be pretty nice in my humble opinion. Lots going on this week too….Dinner with this famous guy on Thursday….and more that I can’t even talk about yet…..but hopefully soon….wish I could stay in Blog land longer tonight, but I gotta get working on a writing up a pattern for a book by above mentioned famous guy that I will tell you more about later too…..so stay tuned……. Thanks Sheri! yep I’m coming to Market! see you there! Wow! You are so talented! 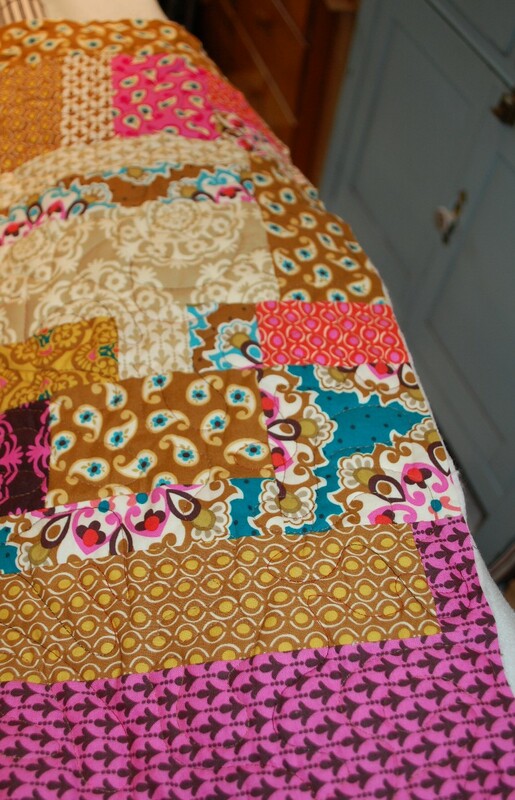 What an amazing quilt to just throw together really quick! I wish! Thanks for all the beautiful pictures! 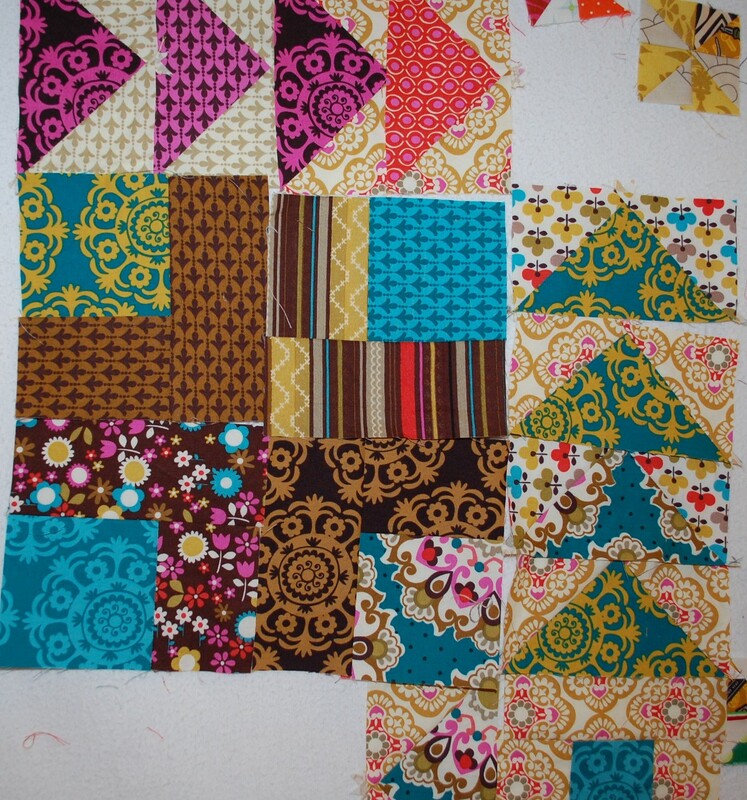 Great pics of the quilt and progress. I really like the color combinations. I’m on to officially thank you for my prize package I received today, it couldn’t have come on a better day. It is all so wonderful and I am so grateful. My tin will hold all the special little things of the day that I enjoy looking at. I think I’m going to forget about my need for a “Scrapaholics Anonymous” meeting and just go with it. (SA is also my husband’s initials, I wonder if that’s a pun in the making?). Thanks again!! I love your sneak peeks! That fabric is to die for!! Love the fushia colors! Can’t wait for the finish! Way to go Scott! 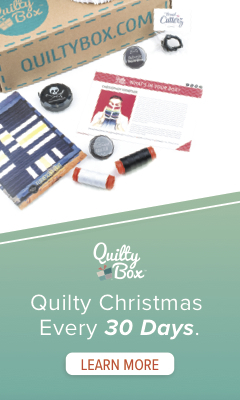 Love your idea and your quilt! !